At SXSW 2015 we had the opportunity to interview James Ford Murphy, head of animation at Pixar Animation Studios, about his short animated film Lava. Lava is a 2014 animated musical short film, produced by Pixar Animation Studios. Directed by James Ford Murphy and produced by Andrea Warren, it premiered at the SXSW Festival on March 15, 2015 and will be theatrically released with Pixar’s Inside Out on June 19, 2015. How does it feel to be directing your own short feature after working on so many big feature films including Finding Nemo, The Incredibles and everything else Pixar has created? 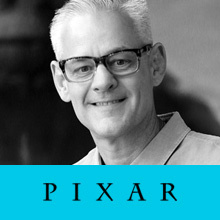 It’s just been fantastic, I think everything I’ve been able to do at Pixar has been great and this has probably been the most personal thing that I’ve ever worked on. As a result it’s probably one of the best experiences I’ve had. Just to have the opportunity to do something like this is so rare, I just couldn’t be more happier or more excited. To be paired with Inside Out, it couldn’t be better for me, I think it’s really special to people. I think thematically they’re both so genuinely about emotion and I’m just so grateful to have this opportunity and come to these festivals to talk about it and to see the enthusiasm people have not only shown for Lava but also for Pixar. Being able to see how many lives it’s touched is remarkable, I’m just very grateful to be part of that. Do you find it more liberating to work on a short animated film compared to working on a big animated feature film? I think they are both two different things. When I was thinking about ideas for shorts, I needed to think about short stories that you can tell in about 7 minutes. It has a beginning, middle and end and you don’t want to be too complex. I think if you are going to do a feature you have to do something that can hold up to 90 minutes, thus you can really flesh it out. It’s two totally different mindsets, I think they are both equally fun to do and I haven’t had the opportunity yet to do it on a feature level like I’ve had on the short level. It’s a terrifyingly invigorating process. Which of the Pixar/Disney shorts is your favourite, besides Lava? 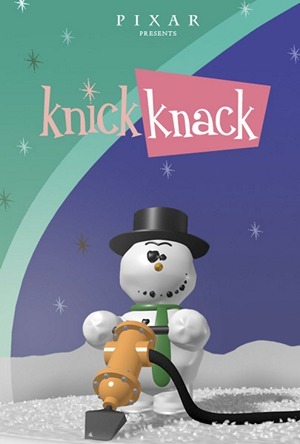 I think my favourite is Knick Knack, John’s (Lasseter) third feature with the Snowman in the snow globe. I love that one, it’s exacty what I was describing; it’s really short, simple, clear and has a great surprise ending. I think the ending in Lava is great too especially when the Moon appears and you’re like ‘Ah, I didn’t see that, that’s so good.’ That’s what I feel with Knick Knack, in that you don’t see that. The little button at the end is like the punchline. 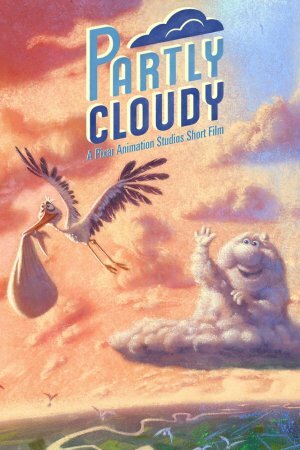 I like Partly Cloudy alot too, I think emotionally it’s my favourite. It’s really sweet. With shorts normally around 10 minutes long, you can watch them over and over again. I guess that’s the appeal with shorts. Absolutely! It’s cool too that they get to live on as shorts collections now on DVD’s, you can watch them strung together, it’s a really cool opportunity. What does the future hold for you after Lava? Do you have any other plans? I’ve got some stuff I’m working on at the studio, I’ve started to think of some other ideas that I’ll start pitching around and just keep doing what I do. I can’t say much more. Lava was inspired by Hawaiian culture, was there something else that inspired you to create this or did it just come to you? I think it was something that just came to me because I sat down and started thinking about ideas. When I decide I want to pitch an idea, there are two goals, the first is to create stories about things I really love and that I can really connect with emotionally because the emotional satisfaction is what I really like. I just love to feel something when it comes to shorts and even films. The other thing is I wanted to come up with three ideas that where very different from each other. If any one of them got selected, I wouldn’t care because I love them all equally. Which came first for Lava, was it the animation or the song? They where pretty much neck and neck, I worked on them together. When I came up with the idea I started working with development and had the idea of it being a song. I started to assemble a song and I had a few images to figure out what the story was as I wrote the song. As we got futher along, with the structure of the song I kind of figured it out. The verses may change but the story was all there. I really wanted to have the reoccurence of the chorus, that by the end of it, you almost know it and it’s familiar to you. It was a nice thing to be actually able to weave the chorus into the storytelling, so the chorus is what brings them together. Usually in most cases the music comes after, at the end you come in and do a score and it enhances what you’ve already seen. In this case the music inspired the song, it’s almost like the song was the dialogue. It was a fun way to use the music as an ingredient in the song early in the process. Was there any singers in particular that inspired the song? There was Israel Kamakawiwoʻole, who was really the big inspiration. His performance of that song ( a medley of Judy Garland‘s “Over the Rainbow” and Louis Armstrong‘s “What a Wonderful World“) was a huge inspiration for the way that it made me feel the first time I heard it, it just blew me away. But it’s a song from the Wizard of Oz, which is one of my favourite musicals, I just love the songs in that film. They are so beautifully written and they’re great storytelling songs. Over the rainbow is what Dorothy sings at the beginning of the movie to tell you that she’s unhappy with her misunderstood life in Kansas and she’s going to go out and find what she’s missing somewhere over the rainbow. It’s such an elegant way of putting it. The Ukelele in the Lava song is so alluring, it just lifts me up and I feel like I’m floating. Kuana Torres Kahele and Napua Greig are the singers. I wanted Kuana to use his bravado so the words finish off like the waves crashing on the beach and all of our shots are like sweeping helicopter shots with cross dissolves that spill into each other. It’s like the guy floating over the beautiful smell of the cheeseburger. The opportunity to record the song was nerve wracking but we just had so much fun. It turns out the two singers Kuana and Napua grew up together, the chemistry they brought together was something that you couldn’t have planned out. It all happened perfectly. The song will be available on iTunes before the film is released in the cinema alongside Inside Out this summer. I take it Lava was a hands on project for you, would you be like that for most projects you work on? I like being hand’s on, I love getting in and rolling up my sleeves. In layout I would sit with Colin, who is our layout lead. With the opening shot, it changed from our storyboards and it became like a discovery of the island. We started playing around in layout and found it together. Once you go between the different stages, you are in this whole new world. With the storyboards, anything is possible as you aren’t limited as much. When you get to layout you are kind of limited to the reality that you set up within the world. One of the things we discovered in layout was the scale of the world. In order to do what we where doing on the boards we would have to move the camera so fast that it made the mountains feel tiny. So I wanted to sit with Colin and understand the scale of our world like ‘take me there and let’s walk around a little bit to get a feel for it. Eventually it became something else, it evolved from the realities of the world that we created. So much about animation is finding it, being inside it and experimenting with things. When we recorded the song I sat in the booth with my ukelele and the singers and I was directing them on the emotion of the song. The rhythm of the song changes alot based on what’s going on in the film. Did you always want to work in animation and with animation you can do anything you want, do you find it liberating or daunting? I didn’t know I wanted to work in animation, I studied Journalism in collage. I did a comic’s strip and that got me interested in drawing. At the time there was no computer animation when I was in school so I ended up as an Art Director. I learnt to animate in Chicago at a small animation studio there and I heard about Pixar, I was just at the right place at the right time. I’m more excited by animation than intimited by it and what I love about animation is that you can tell stories that you can’t in any other medium, that you can bring a mountain to life. What I think Pixar does so well is that they go to these worlds where only animation can go but tell stories that are about human emotions, that human beings can really identify with. When Buzz Lightyear was worried about being replaced with something cooler and shinier, we can all relate to that as we all have that fear. It just makes it all the more exciting because of what we can do in animation. The 2015 SXSW Film Festival was held from March 13 to March 21 in Austin, Texas.